I would need a little help with this match. For the second game, with the same technique, I see that it is favorable to Boca Juniors. But if we see the cycles of the Managers, it would seem that River Plate Manager is much better. First Final: 10/11/2018 - 17:00:00 - Argentina, Buenos Aires DF, Boca. Second Final: 24/11/2018 - 17:00:00 - Argentina, Buenos Aires DF, Nuñez. Natal Chart River: 15/05/1904 - 13:25:00 - Argentina, Buenos Aires DF, Nuñez. First Match in Libertadores (provisional): 10/02/1966 - 19:15:00 - Argentina, Buenos Aires DF, Nuñez. First Match of River Plate's Manager (Gallardo): 16/07/2014 - 20:00:00 - Colombia, Bogota DC, Bogota. Natal Chart of River captain Ponzio: 29/01/1982 - unknown time (12:00:00) - Argentina, Santa Fé, Las Rosas. 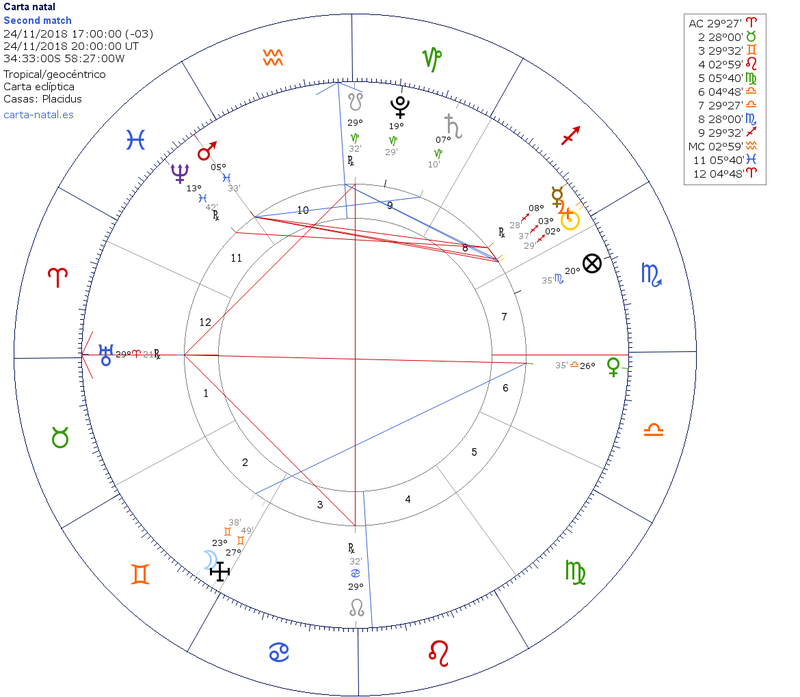 Natal Chart Boca: 03/04/1905 - 14:42:42 - Argentina, Buenos Aires DF, Boca. First Match in Libertadores (provisional): 07/04/1963 - 14:30:30 - Paraguay, Asunción, Asunción. First Match of Boca Junior's Manager (Schelotto) :03/03/2016 - 19:30:00 - Argentina, Buenos Aires DF, Boca. Natal Chart of Boca's captain (Perez): 10/08/1985 - unknown time (12:00:00) - Argentina, Santa Fé, Rosario. Looking at the chart of the match today alone, Boca is Mars in Aqua in 11th; River in Venus in Libra in 7th. There is a seperating sextile aspect between the Moon and Venus (River); which helps Boca. However River Plate is stronger than Boca; in the first half. Second half, should bring ASC/DSC to Taurus/Scorpio, where Boca are better by Sign, but Mars will be in the 10th house (which is River Plate). Jupiter is now in Sagittarius, which will enter the 7th house giving River Plate some advantage too. 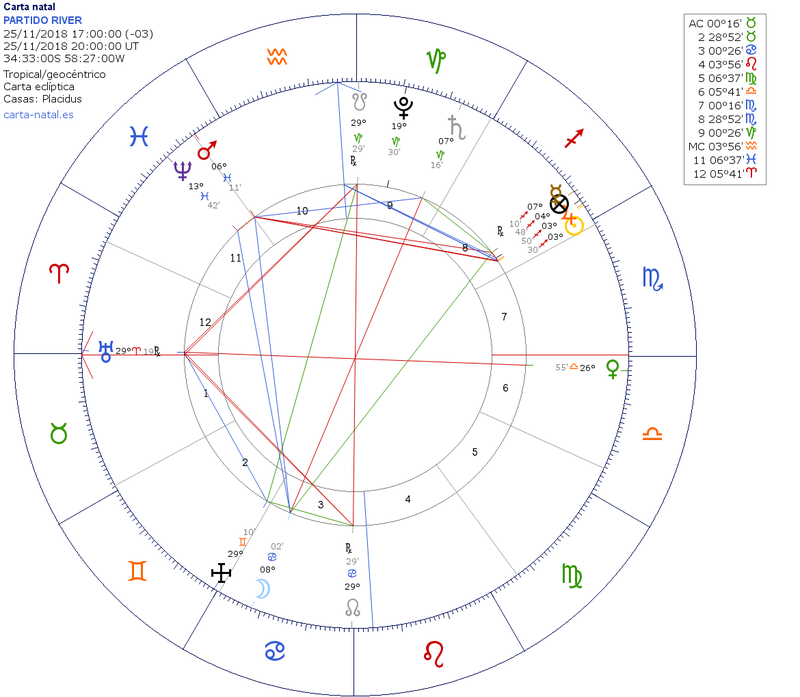 The Moon is also sextiling Mars in Aquarius. I think Boca will start ok, but River should improve as the game progresses. Second half is River or Draw. Does the postpone of the match affects your predictions? Yes it does, if the match is postponed the analysis is void. Unfortunately I didn't have time to analyse again; but the match finished 2-2. Boca were winning 2-1 at half time. Any predictions for the final match? I will try and look at the match the day before kickoff or on the day of kickoff. Hey Sven, how are you? Assigning River Plate to ASC, Boca to DSC. Quick ASC/DSC change after 5 minutes, possible goal and change of rulers. The Moon is applying to Venus next; via a trine, so good for that team but victory won't be immediate. First half seems to favour River Plate. Both planets remain in the same houses. Moon moves closer to Venus in Libra and Venus moves house right at the end into the 5th house. The match has been postponed by one hour because an attack on Boca Junior's bus. The match will be played tomorrow at 5pm. The game has been postponed again asuka, maybe it will be played next week? The game has been postponed again asuka , maybe it will be played next week? Probably the match will be played on December 8 or 9. But River Stadium was suspended and it is still unknown where it will be played.